Ahead of its retail release next week on September 19th, IDW has shared the first 5 pages of issue #9 with Adventures in Poor Taste!, a comic review website! BE WARNED! There are spoilers below! But if you just cannot wait take a look below at the first act of this year’s exciting finale! We get another look at Lamar Wells awesome cover featuring Sonic and Knuckles’ punches being stopped dead in their tracks by Neo. We also are able to confirm the creative team for this issue. Along with Ian Flynn and Tracy Yardley will be Matt Herms on colors and Shawn Lee on letters! The first few pages feature Neo Metal Sonic monologing, giving the details of his master plan amongst shots of Angel Island, now utterly under his dominion. The final pages transition to the Resistance HQ where Sonic and Amy Rose are informing the troops on the situation. As we see Sonic repeat, we already knew that the Resistance was going to need “all of them”, but just how many of Sonic’s expansive cast is included in that? Nathalie Fourdaine‘s cover for this issue gave many hope that we might see some additional characters yet to be introduced, but Flynn’s previous comments on Cream and Cheese cast doubt that this was any more than a fun cover. Comparing the cover and those shown assembled, we see: Sonic, Amy Rose, Knuckles, Tails, Tangle, Silver, Blaze, Rouge, Shadow, Vector, Charmy, Espio and Whisper. However, Cream and Cheese, Gemerl, and Omega are noticeably missing. As a side note, I am happy to announce that this article is officially our 100th! This is a huge milestone for us and we want to celebrate with you! Be on the look out for a special giveaway as a thank you for all our support! 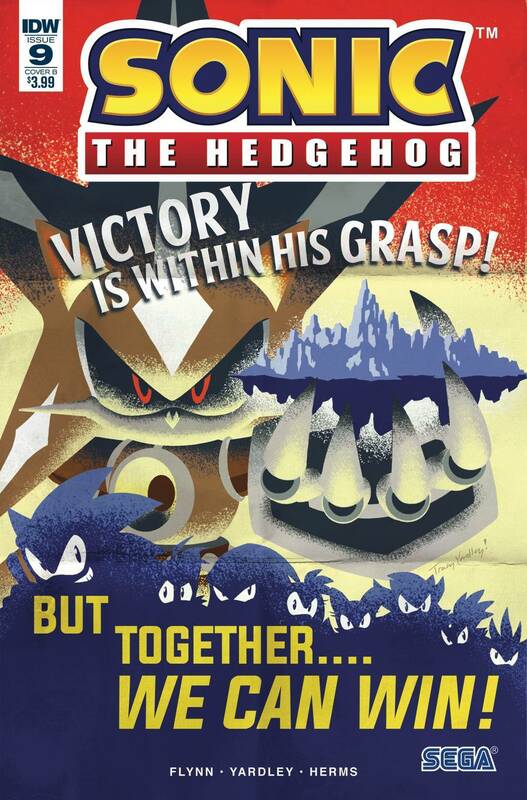 Previous IDW Games Releases Sonic Puzzle! Next Sonic Crash Course Delayed Again! Tracey Yardley has improved I see!